You want to find a propane torch that has a permanent ON button. Without the gas held in the ON position, you would have to hold the propane torch with one hand while using the forge. That's not very efficient. You can see my torch below. The red button is the trigger; the small metal button locks the trigger into the ON position. Strip any plastic or paint from the outside of the coffee can. Drill a hole in the side of the can large enough to fit the nozzle of the propane torch. Cut your ceramic wool to length so that it covers the inside of the coffee can. 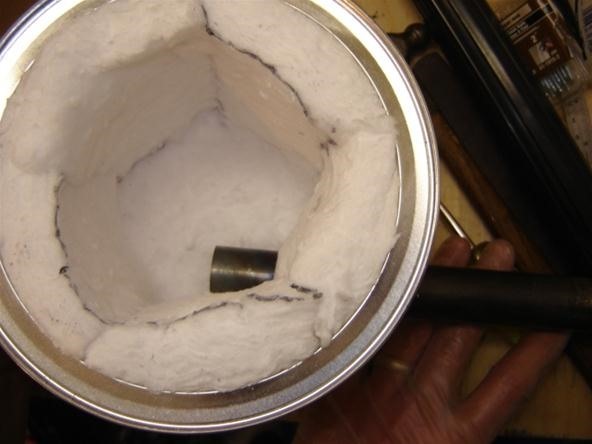 Note that you will need a separate round piece of ceramic wool to cover the far end of the can. Once all of the wool is in the can, it should keep its form without any adhesives or fasteners. 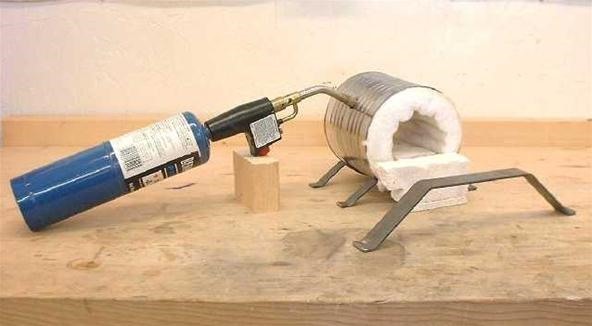 Be sure to cut a hole in the ceramic wool where the propane torch nozzle will be. Technically, your coffee can forge is all ready to go right now. However, with this thing heating up to a few thousand degrees Fahrenheit, we may want to make a stand to keep it off our nice tables and floors. Depending on the angle of your torch and the angle of the hole in the can, you might need to have a separate base to prop up the propane torch in the correct position. 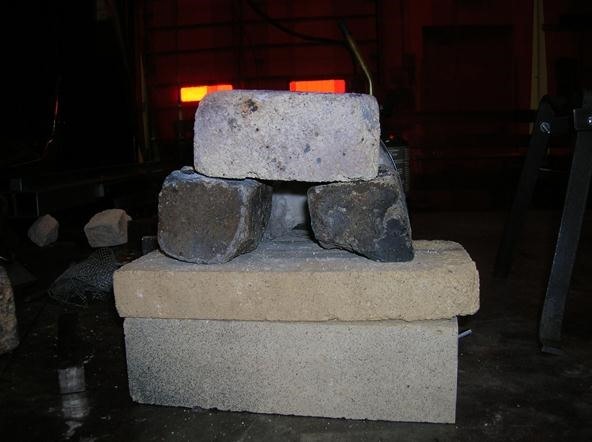 The firebricks provide a tough solid surface for resting our metals on while the heat. They also help cover up the gap in the front of the can to keep heat in. Also, the propane hole should be facing the bricks. In mine below, the hole in the top right of the wool is facing directly at the firebricks. Step 5 Try It Out! Outside away from flammable objects, turn on your propane torch making sure it's in the constant on position. 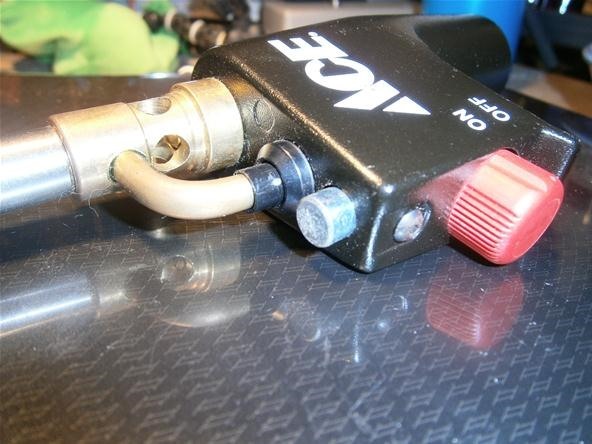 Place the nozzle of the torch into the can via the hole in the side. 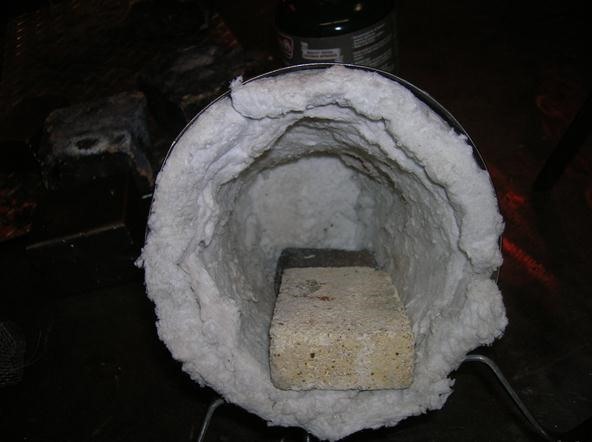 Try to train the end of the flame directly on the firebrick surface inside the forge. 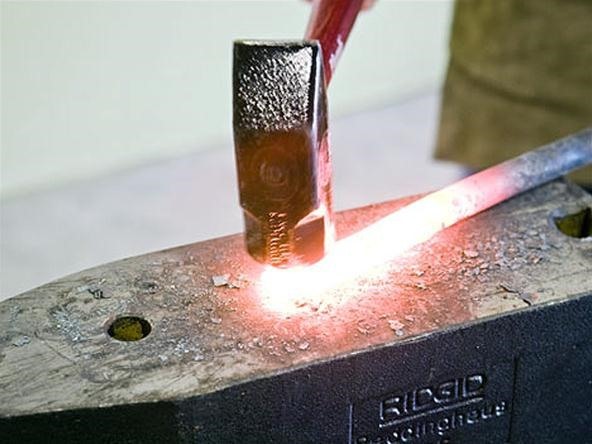 Let it heat up for a few minutes and place your metal object into the forge using a long pair of pliers or tongs. When the metal is red hot all of the way through, it's ready to work! Remove the metal with the tongs and place it on a hard surface. A real anvil works best, but a large rock or concrete block will do in a pinch. With the metal placed flat on the anvil, strike it several times with a hammer. You will notice the metal flattening out as you hammer. Step 6 Become a Blacksmith! Now it's just a matter of time and practice before you are whipping up homemade blades, bolts, and bayonets. There's really no substitute for practice, but this article can show you some of the basic metal shaping techniques. My first project was a spearhead. If you want a fun challenge for your first project, try making a small spade head with a cylindrical bottom for fixing onto a wooden handle. 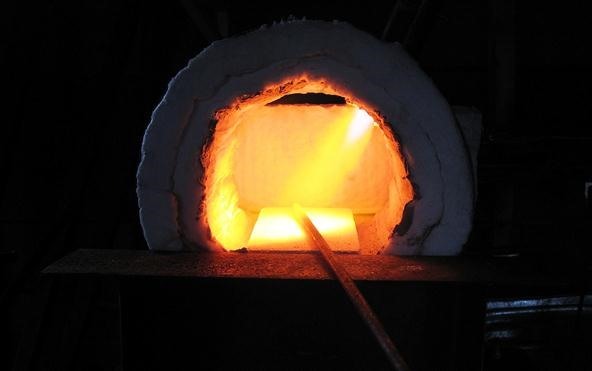 The metal can be tricky to work with, but after a few tries you get a feel for the malleability of the metal and how much heat is necessary for it to be shaped properly. Have you always wanted to be a blacksmith? What would you make with your own coffee can forge? Let us know in the forum or in the comments below. Having trouble? Feel free to ask the community members or message me personally with questions. Don't forget! We are currently accepting entries into our photo contest for a chance to win your very own lucid dreaming goggles kit! Just post a picture on the corkboard of a project you have made or are currently working on. All projects are welcome. Here is my example entry. Now this makes me want to start a hardwood fire in a forge and get a airpump hooked into a metal pipe going into the base of the fire and heating metal over the extreme heat of the coals and fire. Nodachi ;) Now there's a feat if you ever forge one of those. I have been watching the show forged in fire and lately its gotten me very interested in forging knives. I have always been very interested but for some reason this really sparked it. I have toyed around with jet lighters and melted pennies and I even made a little heart from what I could only assume was zinc knowing the composition of a penny. I digress. This coffee can forge really for me pumped and I plan to buy all the materials in the coming weeks ( I have found all the materials for about $100 except the anvil, I plan to use concrete slabs and what not) and start really hammering metal. 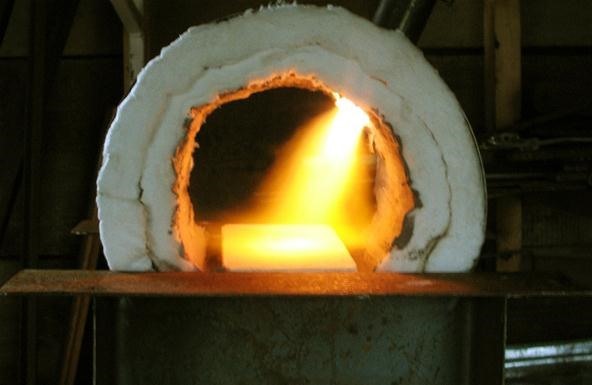 I had not expected this post to be as long as it is but watching the show; and I am an EXTREME newbie, I wonder how can I get my steel sharp after I heat treat it without professional/power equipment since I am on a budget and I am doing this as a backyard hobby. Is there a special type of coffee can I should get or do mean a thing that is commonly called a coffee can but has a different actual name? I wand to build one myself so I can make swords and axes and knives, also will an old propane tank with the top cut off work in place of the coffee can?